My 15th country on-hand, 20th solo backpacking trip, 2nd visa application for tourism on entire single page, 1st winter get-away this 2012, 1st country to visit in African continent and of course, usual budget do-it-yourself itinerary from arrival to departure. Egypt is perhaps best known as the home of the ancient Egyptian civilization, with its temples, hieroglyphs, mummies, and - visible above all - its pyramids. Less well-known is Egypt's medieval heritage, courtesy of Coptic Christianity and Islam - ancient churches, monasteries and mosques punctuate the Egyptian landscape. As the ancient Greek historian Herodotus stated: "Egypt is the gift of the Nile", probably one of the most popular tourist destinations worldwide. visa - Filipino's need to apply 1st before travel. how to apply tourist visa in Egypt? 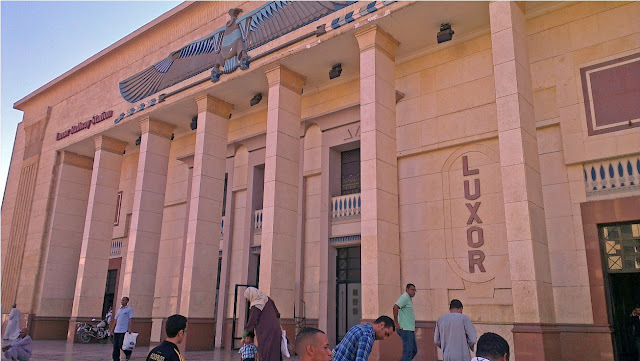 I purchased my outbound ticket to Cairo via ZED fare applied in Egypt Air while the inbound (returning flight) from Luxor was a Jazeera Airways regular fare. Of course, Eid holiday is obviously a peak season to travel and gambling that cheapest fare is a dangerous. While a regular return ticket via Jazeera airways which costs a monstrous $482 = php20,250. ZED stands for Zonal Employee Discount which allows employees of airlines participating in the ZED Program to purchase reduced rate standby transportation for leisure travel calculated on fixed/standard fare levels (High, Medium, Low) applicable to global zones based on mileage. ZED is used instead of the industry discount (e.g. ID90, ID95, etc.) and are for stand-by travel and carry a boarding priority on the other airline which are valid for 90 days from the original issue date. Eid al-Adha "festival of sacrifice", also called Feast of the Sacrifice, is an important religious holiday celebrated by Muslims worldwide to honour the willingness of the prophet Abraham to sacrifice his young first-born son Ishmael as an act of submission to God's command and his son's acceptance to being sacrificed, before God intervened to provide Abraham with a ram to sacrifice instead. In the lunar Islamic calendar, Eid al-Adha lasts for four days. Finishing the 2012 summer season get-away for all countries which Filipino's have visa on arrival privilege outside Southeast Asian Nations and afterwards 2012 rainy season trips in my home country with my family. Now for winter season, and as far as my backpacking knowledge is concern, month of October is a good start to do it especially long holidays in a Muslim country. Typical Backpackers bucket list include Amazing Thailand (which I visited in 2010 as my 1st solo abroad), Incredible India (just this year) and now, the haven of mankind's history. The best early civilization in the world and a must visit for all aspiring world travelers out there is to visit the Arab Republic of Egypt. Upon exiting the Arrival gate of Cairo Airport Terminal 1, the 10 o'clock direction of parking area is where the free shuttle bus going the public terminal located. Just ask the driver to drop-off to the bus terminal with 5 minutes travel time, bus color is blue. There you will see an absolute all arabic destination and numbers. Just listen to the barker's call or ask someone who can speak english to the preferred destination. In my case, I wanted to go to Ramsis train station to be able to book my ticket first bound to Aswan before strolling around the downtown. Bus fare costs only 2 EGP with around 30 mins travel time. How did I know where to alight? Again, I asked local passengers and they were vigilant to assist, just be selective who to ask for.